Leather Jacket Styling and Outfit Ideas. What outfit looks best with a leather jacket? How can I wear a leather jacket in Fall or Summers? Do Leather jackets go with brown boots? Today we answer all your questions. Leather Jackets have always been a must-haves to complete a chic look. However, pairing these jackets is a hassle especially when you do not want to overdo it yet want to have a fabulous look. If you don’t have a leather jacket yet, or feel like it’s time to get another one, then the tips below will help you buy the right one. A leather jacket is a life-long companion that you will be investing in. So choose one that’s in a style that will last the longest. Don’t just go for the latest trends since they fade out sooner or later such as the leather bomber jackets. Instead, opt for one that can be worn anywhere and anytime, for instance, the leather biker jackets. It’s best to buy a jacket after trying it first so try to avoid shopping for it online. Before buying the jacket, have a look at its inner lining to decide if the material is suitable for you. If a jacket does not come with a lining then its best to stay away from it as leather wears off pretty quickly when in contact with skin and it also isn’t too comfortable to wear this way. 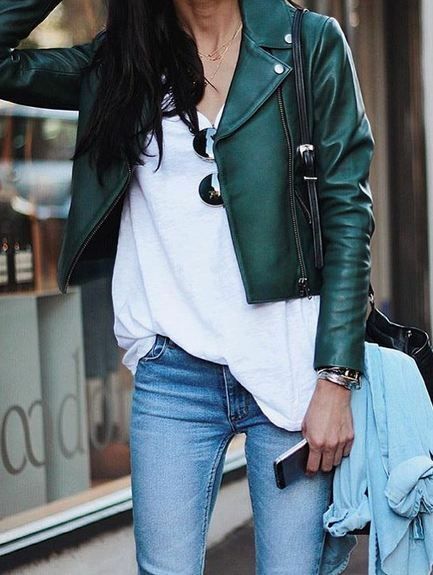 Since leather jackets give off rather sturdy vibes, you can try to neutralize that effect and add sophistication by pairing them with light, feminine colored cotton shirts. Now let’s move on to some amazing styling ideas for you, create a look that not only compliments but augments your leather jacket look. One style tip that you might notice in the following pictures; avoid dressing in the same color from head to toe when wearing a leather jacket as a monochrome leather look isn’t too flattering. Be casual in style. Green jacket with white plain shirt and faded jeans is all that you need. Make it all about being casual but don’t forget to keep it stylish. A green leather jacket is something all girls need in their closets because of the chic look it can give to any outfit. Even the model Miranda Kerr can’t stop loving her green leather jacket. She too has paired it with a white shirt and jeans. You can see how the jacket adds style to the simplest jeans-shirts combinations. Set the statement with white. Pair your white leather jacket with some beige boots and a white bag. Red nail colors and some trendy shades, and you have the runway look for yourself. Pair your simple leather jacket with a cheetah print clutch and some skin shade stilettos. This is all you need to be glamorous and fabulous in Fall. Since the Fall season is all about shades of brown and burgundy, a brown leather jacket looks nice when worn outdoors. So it would be a great choice for picnics, hikes or just a stroll in the park. Get a girl next door look. Pair your black leather jacket with a black and white checkered dress and set the simple yet classy look for yourself. Like the check dress? Then you must have a look at 18 Best check shirt outfit combinations for Girls in all seasons. If you want to take things up a notch, then take style tips from Kendall Jenner as she rocks a cropped black leather jacket with a white shirt, ripped jeans and black ankle boots. It’s one of her top swag street style looks. Long coats can help you glamorize your look within minutes. Wear it over any short shirt and jeans and your look is complete. Be smarty pants! Pair your jacket with a beanie and a messenger bag, and you are all set to go with the classy nerd look. Make it all about the jacket. Wear this jacket with a bun and some trendy shades, and your look for the day is all done. Do have a look at 17 cute winter workwear outfits for women for an elegant look. If you’re looking for what to wear with a red leather jacket then an all-black outfit is the best choice. If you don’t believe us, then here’s Bethenny Frankel rocking her hot attire in a scarlet red leather jacket. Give a girl a chocolate brown leather jacket and some faded jeans, and she is all set for a casual yet chic look. Accessorize your dress with this buttoned-up jacket and add the glamour to your usual style. This season makes it all about the browns. Create the perfect college girl look. Wear a simple shirt beneath your leather jacket. Give your hair a messy look, and you are all set to go to college. Light colors always please the eye. Make your regular outfit standout with a cream colored leather jacket and some stilettos. Create an ultimate bubbly look by pairing a brown leather jacket with a knit-wear. Throw over a woollen scarf, and you are all set for the season. Pair your creamy leather jacket and glamorize your simple wardrobe. Flaunt this style with messy hair and simple inners. Set your tone in blue, a blue leather jacket will brighten up your wardrobe. Pair it with a high ponytail to give yourself a chic look. A classy black jacket accessorized with a vintage necklace is all that you need to create a style statement. Black leather Jackets with faded jeans is the ultimate look of the season. Drape over a leather jacket on a pencil skirt put on leather boots and you are all set to turn some heads. Make this season all about leather. Leather boots paired with a traditional black jacket is all that you need to get a runway look. Planning a formal look? Wear a black buckled jacket on your dress and add in some color with a classy neck piece. Your must-haves for the season gives yourself a complete fabulous look. Pair your jacket with some high heeled boots and a pair of fashionable shades.